The tradition continues with the 36th Annual Holiday Parade in Downtown Brentwood. 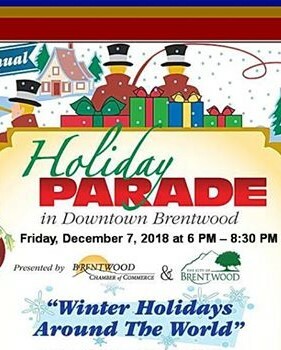 Bring your family and friends to this FREE holiday event in Downtown Brentwood! Date: Friday, December 7, 2018 at 6:00 p.m.
Equestrians you must provide your own pooper scooper for the parade route. 1. NO SANTA CLAUS ENTRIES ALLOWED! THE CHAMBER OF COMMERCE PROVIDES SANTA CLAUS. 2. Completion of the parade route is required of all entries. 3. Parade officials will be stationed along the line of parade route. They will be clearly identified and their authority must be respected. 4. Safety dictates that NO entry may throw, discard or spray objects from their entry on the parade route. NO CANDY, NO TREATS; DO not THROW ANYTHING INTO THE CROWD OR TO INDIVIDUALS! Items may be directly handed to individuals only!! 5. FULL CONTROL of animals and vehicles is required at all times. No one may sit on the front of any automotive vehicle. 6. Each participant is responsible for cleaning up their area. 7. Failure to adhere to any of these rules will result in removal of unit and disqualification. 8. No drinking is permitted before and during this event. If you are in the parade, please be safe, & be SOBER! · Judging areas will be on one side of the streets and clearly designated. · Due to the size of the parade last year, Parade judging stand performances are limited to 3 minutes and will be strictly enforced. · Judging score will depend upon use of the parade theme, effort spent on entry, and showmanship. · Awards will be presented at the Holiday Mixer In December. More information on that to follow! · Those not present may pick up their awards within 30 days at the Brentwood Chamber of Commerce Office at 35 Oak Street., in Downtown Brentwood.